Williamsburgh was an ephemeral city in Kings County, New York, today the area is a part of Brooklyn. It only existed as a city for 3 years, from 1851 until 1854, when it was annexed to the City of Brooklyn, which was itself subsumed within the City of Greater New York in 1898. "In 1827 the village of Williamsburgh was incorporated within the town of Bushwick; in 1840 it became a separate town, and in 1851 a city. In 1854 Williamsburgh and Bushwick were annexed to Brooklyn as the Eastern District of that city, usually abbreviated "E.D." (the original city was then briefly called the Western District." 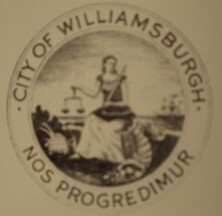 This is its seal, derived from an image in a commemorative book, "The FIRST HUNDRED YEARS 1851-1951 -The Williamsburgh Savings Bank" written by Edgerton G. North, Copyright 1951 by The Wiliamsburgh Savings Bank. The seal contains a number of elements, most prominently a woman seated holding a sword and the scales of Justice, beside her a shield, a cornucopia, a beehive, and an anchor. In the distance, a sailing ship is plying the East River beside this coastal city. The motto is "Nos Progredimur". My Latin is rather rusty, I imagine this means something like, "Let Us Progress Together". I have no direct confirmation that this seal was used on a flag, but this seems to have been the common practice of the cities in this area at that time. Incidentally, this area still exists as a Brooklyn neighborhood, now spelled without the 'h' as Williamsburg, among other things known for its large artists' colony of those priced out of Manhattan. The old spelling 'Williamsburgh' did long outlive the city and is still associated with some landmarks and institutions, most notably the Williamsburgh Savings Bank, now known as 'Dime Savings Bank of Williamsburgh' with its architecturally magnificent central branch, and the Williamsburgh Savings Bank Building, Brooklyn's only skyscraper, now belonginging to HSBC. And with the new spelling is the grand if poetically neglected Williamsburg Bridge to Manhattan.